By now, the benefits of increasing student literacy are well understood to be a key factor in student success across a broad spectrum of subjects, from science to civics. At a time when math and STEM concepts are finding their way into an increasing number of curricular subjects and career paths, math literacy in particular has assumed a vital importance in the 21st century. The same cannot be said of math class technology. While language arts classes have benefited from the positive effects of technology in the classroom, including increased engagement, individualized learning, and more robust collaboration, math and other STEM subjects have been left behind. 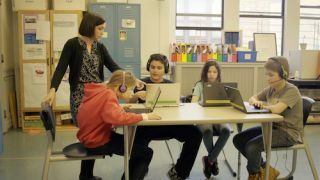 This technology gap is in part because modern tech tools such as Chromebooks, tablets and laptops often don’t have the necessary tools to help students translate their thoughts and ideas into screen-friendly math language. Digital programs have difficulty with simple notation symbols such as square root (√) or pi (π), not to mention the more complex formulas like the quadratic equation. And most equation editors require a high level of knowledge of math syntax to create these symbols and formulas. Enter EquatIO™, a Google Chrome extension* from Texthelp® that is compatible with Google’s near ubiquitous suite of collaboration tools, including Docs, Forms, Slides Sheets, and Drawings. EquatIO makes it easier for students of all learning levels and styles to make math digital and benefit from the use of technology. The extension features a robust equation editor, which enables students to input math in the form they prefer. Students can speak into a device and watch as it translates their words into equations before their eyes. A predictive text feature suggests possible formulas and equations the student might be working toward. And on touchscreen laptops, such as the new generation of Chromebooks, a special tool digitizes handwritten math. Students can even use EquatIO to have problems accurately read back to them through Read&Write integration. When students can focus their attention on concepts, not syntax, it opens a whole new world of excitement in the problems math can help solve in their everyday lives. Finally, every student can confidently, and accurately, say they are a math person, too. Despite the great strides education technology has made during the past decade, its impact on the math classroom has been limited. With a recent push toward advancing deeper learning, math experts look at how emerging technology is improving student engagement, allowing teachers to focus less on memorizing formulas and more on real-world applications for math that will serve them the rest of their lives. *Availability of EquatIO within the Microsoft Windows environment is coming this Fall.